in the hot summer mud. leaves on windy fall days. best kind of feet there are. *Copyright 2009 by Tessa Haggerty. 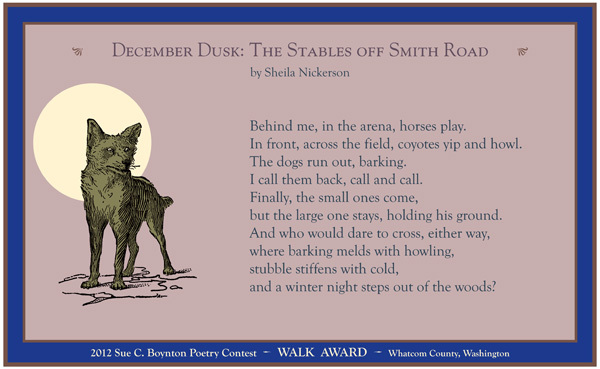 This poem appears in POETRY WALK: Sue C. Boynton Poetry Contest – The First Five Years. Placard design by Egress Studio. 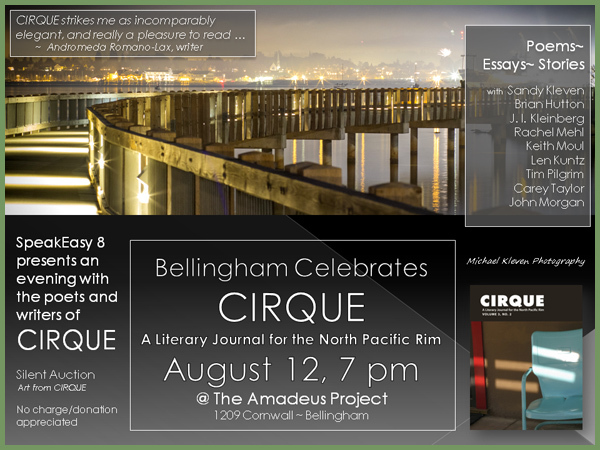 You are invited to join the writers, artists and editors of Cirque, a literary journal, on Sunday, August 12, 7:00pm, for a reading at The Amadeus Project, 1209 Cornwall Avenue, Bellingham. Writers include include Brian Hutton, J.I. Kleinberg, Sandra Kleven, Len Kuntz, Rachel Mehl, John Morgan, Keith Moul, Tim Pilgrim and Carey Taylor, and the evening will also feature a silent auction for framed artwork from the pages of Cirque. A second reading will be held at 7:00pm the following evening at ACT in Seattle, featuring Christianne Balk, Janet Buttenwieser, Jacqueline Haskins, Brian Hutton, J.I. Kleinberg, Sandra Kleven, Charles Leggett, Stefon Mears, David Stallings and Carey Taylor. Cirque in Bellingham is a SpeakEasy event produced by Luther Allen. Writing poems, for me, is a bit like mining a seam of rock. One day you get some silver, and the next day you get just rock. There are scores of “best of” lists for fiction and non-fiction, but Austin Allen, a poet and adjunct professor in creative writing at Johns Hopkins University, noticed that “no one has yet compiled a similar list for poetry.” He took it upon himself to start the conversation, choosing, for entirely subjective reasons he explains in “What Are the Best Poems of the Past 25 Years?” five poems and five runners-up. Which poems would you choose? Have a look. Read the poems. Read Allen’s explanations. Even if you disagree with Allen’s choices, these are still poems worth rereading. Behind me, in the arena, horses play. In front, across the field, coyotes yip and howl. The dogs run out, barking. I call them back, call and call. but the large one stays, holding his ground. and a winter night steps out of the woods? *Copyright 2012 by Sheila Nickerson. Placard design by Egress Studio. This post is more about the poetry of flowcharts than it is about poetry. If you’ve ridden the bus, taken a plane or gone to the beach lately, you’ve probably noticed that a lot of people are reading The Hunger Games, a “dystopian” fiction. 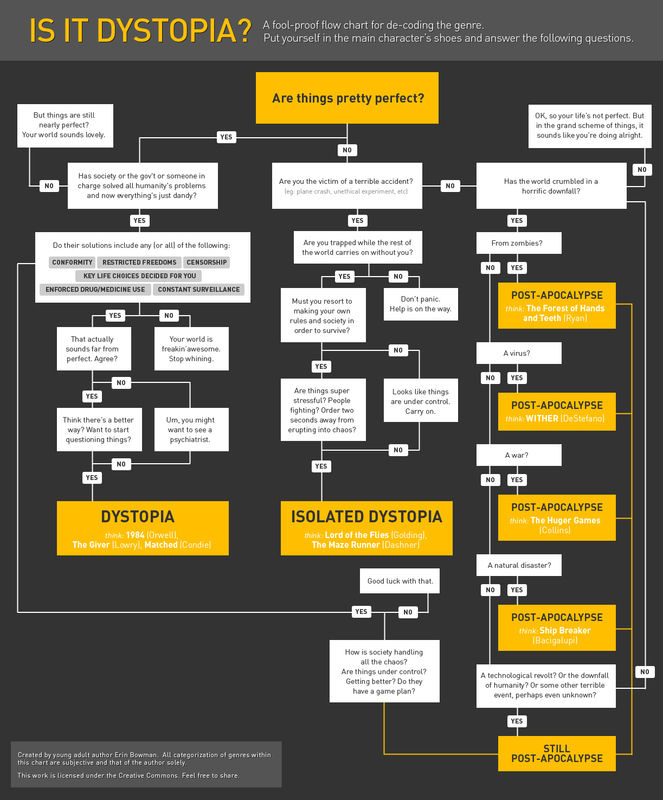 If you’re not sure what qualifies as dystopian, start here, with Erin Bowman’s flowchart for decoding the genre. If you’re curious what books have qualified as dystopian, have a look at the goodreads timeline of dystopian literature. If you’re already hip-deep in The Hunger Games and wondering where to turn next, here’s a magnificent answer from the Lawrence (Kansas) Public Library. And where does dystopian poetry fit in? “The Waste Land” by T.S. Eliot… “The Second Coming” by W. B. Yeats… “Fragments for the Gates of Times Square: The Fear of Neon” by Philena Pugh… Where’s the flowchart?! 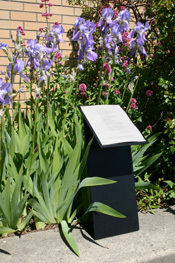 Read and hear poems and find out more about this worthwhile program from the Red Room Company.